Historically silver has a seasonal tendency to peak in February. Our seasonal analysis shows that going short on or about February 20 and holding until about April 25 has worked 35 times in the last 46 years for a win probability of 76.1%. As you can see in the short silver(NYSEARCA:SLV) table, the usual February silver break was trumped by the overarching precious metal bull market of 2002–2011 just four times in ten years. After suffering losses for two years in a row in 2010 and 2011, this trade returned to success with its second-best performance in 2012 as precious metals in general fell out of favor. This trade was then successful in 2013, 2014 and 2015. A shaky start for stock markets in early 2016 combined with multi-year lows for silver sparked fresh demand for the metal resulting in a loss that year, but this trade returned to success in 2017 and again in 2018. Last year, sizable gains could have been realized with a longer holding period as silver retreated in earnest after mid-June. 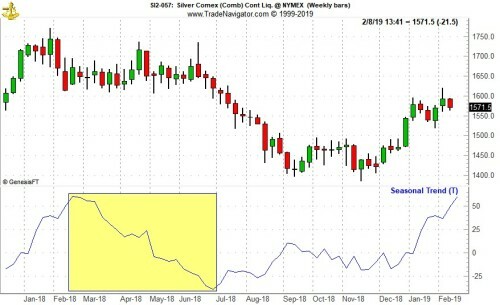 In the above chart, silver’s weekly price bars appear in the top half of the chart and silver’s seasonal trend since 1972 appears in the bottom half. Typical seasonal weakness is highlighted in yellow. Historically, silver has declined from late-February/early-March until the end of June. This year, typical seasonal weakness has yet to materialize, but silver does appear to be running into some resistance just above $16 per ounce. Just above $16 per ounce was a key support level silver held for much of the spring last year before breaking down. Silver could continue to rally modestly higher so waiting for early signs of weakness before executing any trade appear to be the prudent course of action now.